Ultra Bright Lightz is proud to announce we have just celebrated our 10-year anniversary! We would like to thank all of our loyal customers for sticking with us throughout the years for all of their emergency vehicle lighting needs. Our recent rapid sales growth has been our greatest accomplishment and we cannot wait to see where the future of our company takes us. We have transformed from a business ran by just the owner into a business with many employees in a 5,000-square-foot warehouse. It is humbling and rewarding to be able to provide jobs to our dedicated, knowledgeable staff and to soon provide many more jobs as we continue to grow. The warehouse we moved into just last year has allowed us to keep many lights in different color combinations in stock to get orders out as quickly as possible to our customers. 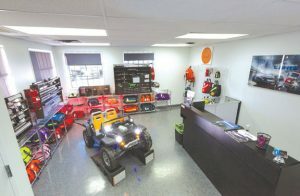 It has also given us the space to have a showroom where customers can see all of our lights in action in order to make the right choice for their vehicle needs.